1. Place the cut chips into a bowl under running water for 5 minutes to wash off the starch. 2. Place 2kg cold tap water in a large saucepan and add the potatoes. Place the pan over a medium heat, bring to the boil and simmer until the chips are almost falling apart (around 10 minutes, depending on the potato). 3. Carefully remove the cooked chips and place them on a cooling rack to dry out and cool. Then place in the freezer for at least 1 hour to remove more moisture. 4. Heat a deep-fat fryer or a deep pan no more than half filled with oil (to a depth of around 10cm) to 130°C. Fry the chips in small batches until a light crust forms (approximately 5 minutes). Remove from the oil and drain on kitchen paper. 6. 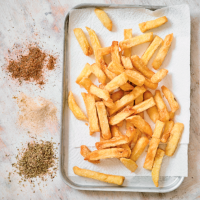 Heat the oil in the deep-fat fryer or deep pan to 180°C and fry the chips until golden (approximately 4-5 minutes). Drain and sprinkle with the sea salt or flavoured salt. Including half the Old Bay seasoning.